Part of this year’s Watson conference theme asked scholars to consider how our work matters to the world and how it materializes in the world. The first two presenters of the G.10 session responded to this call by looking outward, analyzing the treatment of queer bodies and queer material artifacts in institutional and digital spaces. The next two presenters responded by looking inward at theoretical concepts and pedagogical practices, challenging our field to attend to the material aspects of meaning-making. 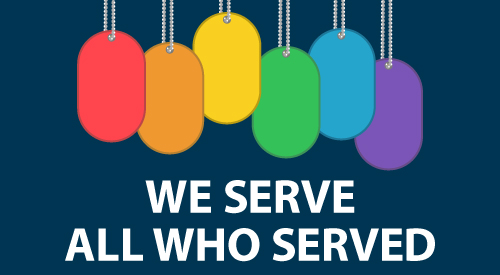 In the aftermath of the U.S. military’s Don’t Ask, Don’t Tell policies in effect from 1994-2011, LGBT veterans, who had been required to conceal their identities, were then left with significant barriers to healthcare. As a “queer veteran researcher,” Christina Puntasecca Luiggi’s presentation employed genre theory in rhetorics of health and medicine to examine the Department of Defense’s LGBT inclusion strategies and subsequent “inclusive propaganda” that have proliferated since the policy changes. 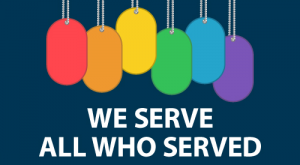 The most common visual used as an inclusion strategy, appearing on 50% of LGBT DoD webpages. Luiggi’s textual and visual analysis of digital and printable materials, such as the poster above, led to her categorization of two types of webpages for LGBT veterans: the “prototypical minimally customized webpage” (example) and the “highly customized webpage” (example). From this comparison, Luiggi was able to identify their exclusionary practices and then develop concrete recommendations for DoD webpages that could improve communication barriers to healthcare access, such as consistent use of right-rail contact that includes, at minimum, the name, email address, and phone number of the LGBT Veteran Care Coordinator program. Rick Wysocki’s presentation encouraged us to think about an undervalued aspect of archives: their materiality. 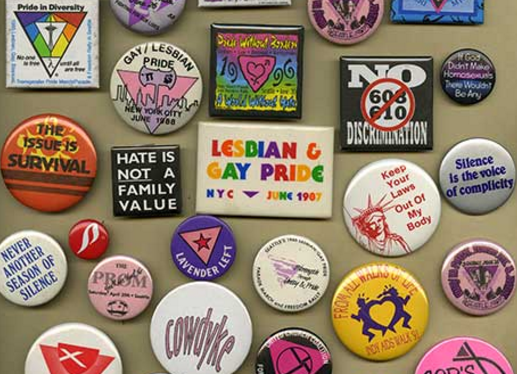 Influenced by rhetorical, new materialist, and queer theories, Wysocki explores both the material objects found in an archive of local queer activist artifacts as well as the material practices employed in organizing and displaying the archive in the University of Louisville library. He offered two examples of tensions that surfaced during this process. The first example was a large, unwieldy umbrella, flown at a Gay Pride Picnic in Louisville in the mid-1980s that the archivist struggled to fit into the parameters of the archive. For Wysocki, the umbrella fulfills Jose Esteban Muñoz’s notion of queer ephemera as evidence, as the figurative and literal queerness of its material makes it difficult to preserve and pass down. The second example focused on the check-in procedure for visiting the archive, which required personal information as well as a photo ID scan—a “material inscription” that Wysocki identifies as a potential risk for LGBTQ-identified visitors. Placing theory into action, Pendygraft presented findings from his interviews with queer bodies (bodies that are labelled queer, but not necessarily queer-identified folx) situated “in and through particular places” of Appalachia. By foregrounding the body in the early questions of the interviews, he was able to uncover the meaningful ways in which the body supported or suppressed subjects’ writing practices. Michael Baumann’s presentation echoed the concern for accounting for embodiment in research. By asking LGBTQ writing instructors if/why/how they choose to come out to their students, Baumann’s extensive study of queer visibility in the writing classroom attempted to fill in certain gaps in previous similar research, such as the intersections of generation, geography, and race. All four of these presenters moved beyond the typical call for a conference presentation to offer us something new to think about, as they extended care for how people in the world might be affected by the work they perform for the university. This move might invoke a “think-practice” as defined in Jacqueline Rhodes’ keynote essay: to think-practice is to recognize that philosophical argument and practical political action cannot be so easily separated, as they are always intra-actively becoming and intersecting, never distinct from one another. At the G.10 session, it was made clear that queer rhetorical research cannot separate itself from the material, the embodied, the lived experiences of queer people.